In a pan, add 4 tbsp of oil. Add onion, crushed ginger, garlic and sauté. To this add dry curry powders (chili, coriander, turmeric, garam masala, pepper), chicken and salt. Cook with required amount of water. Let the gravy thicken. Add coriander leaves, curry leaves and cooked tapioca. Mix well so that the masala combines well with the tapioca. 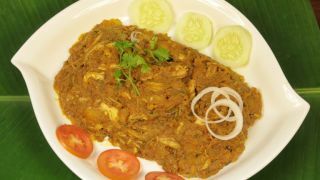 Beef can also be used instead of chicken for tasty Kappa Beef biriyani.